The Gray Iron Fitness Newsletter, Issue #208. Seeking the perfect place to workout. 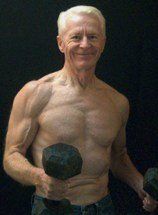 Some time ago, Don T. (then age 59) opened his e-mail and discovered five different offers, each claiming to provide him with the "perfect workout." One promoted kettlebells. Power lifting with barbells is the way to go, said another. Bodyweight calisthenics are all that's needed, a third one chimed in. Even Chuck Norris invited Don to take a Total Gym for a trial run. Wow! And who can resist those Christie Brinkley infomercials? Don T. lives in the midwestern U.S. He said he’s a little overweight but is in reasonably decent shape. He does a little jogging and has at various times worked out in commercial gyms. He doesn't see himself as a novice. But he wants to get more serious about his fitness, and he wants to workout at home. He emailed me to ask which device(s) or method(s) I thought would provide perfect workouts. To start with, the method or equipment that is most likely to hold his interest over time, not just for a month or two, is his best bet. That’s certain. And it is Don's expectations and preferences that are the key. If competitive power lifting or the Olympic lifts are his reason for working out, he must have an Olympic bar and plates. Nothing else will do. He'll need some coaching, too, from a competent trainer. But for all around fitness training, practically any one of the offered equipment and methods will serve him well -- if he enjoys it. Let's not overlook that Don's age must also be taken into account. At 59, certain kinds of training may begin to put too much stress on his not so young tendons and ligaments. Resistance bands, bodyweight exercises, kettlebells, or devices like the Total Gym can be easier on aging joints. If he decides to stay with standard barbells and dumbbells, he probably ought to apply abbreviated workouts. In fact, even most young people who workout probably over-train. And this is critical: All the talk and promises in the world from sellers of specific products won't mean a thing unless he gets pleasure out of his workouts. Training should be challenging, but at the same time there has to be the workout likability factor. Without it, even the latest and greatest training apparatus he can find will end up stored in a dusty corner of the garage. If possible, he should buy weights, bands, or other devices that he has actually tried out. Or if he's had no experience with the equipment, he should make sure the company he buys from offers a return policy. And last, no matter what equipment or method of training, his comprehensive program should have three components: 1) Resistance training; 2) cardiovascular exercise; and 3) some flexibility movements. There are several ways, such as circuit workouts, to combine all three components in a single format. Or many people prefer keeping them separate, such as working with weights one day, cardio the next, and staying limber by stretching a bit after each session. Here’s wishing that Don T. creates a home gym that suits him. Putting one together can be a lot of fun.